I'm trying to work on the 2018 Canadian UFO Survey, but I keep getting distracted. Those danged UFOs keep being reported, and 2019 is starting off at a frenzied rate. On January 9, 2019, a couple north of La Ronge, Saskatchewan, watched an object with a fiery tail progress slowly eastward at about 8:45 am. 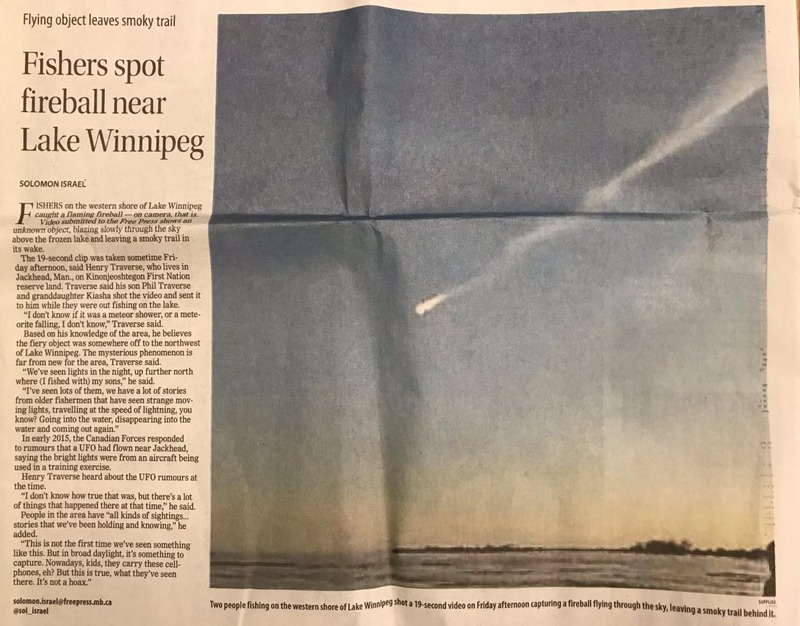 They were convinced it was not an aircraft, but from their description it likely was a high-altitude jet with a contrail illuminated by the rising sun. I did an interview with a Prince Albert media outlet about this. By the time I looked at the video, it was already all over social media. The witnesses posted it and sent it to several news outlets. I never did speak with the actual witness who shot the video. It was typically unstable and it was hard to see in the 20-second clip that this second fiery object with a tail was stationary or moving. The story I was told was that the object was observed for at least 15 minutes as it moved slowly through the sky. This was a crucial detail, albeit wrong. If it was moving slowly, that would rule out meteors, fireballs, rocket re-entries and satellites, but not a slow-moving jet reflection the setting sun, with a contrail. 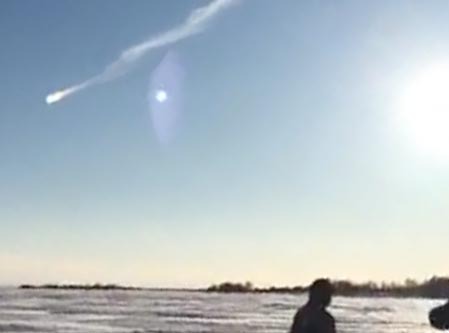 But the object seemed far too bright to be an aircraft shining in the sun, which was clearly visible in the video and was also creating the familiar "blue orb" effect caused by lens reflection. To check which aircraft had passed over, I tried asking some aircraft observers but couldn't get a good response. I then showed the video to some ufologists (including debunkers) for their opinions. The next day, I heard the contrail had simply hung in the sky for the entire observation. That changed everything. Looking at the bright object at the end of the contrail, it showed a colourful rainbow-like effect that is common in sundogs. But there was no complementary sundog on the opposite side of the sun in the video, so I was puzzled until I realized the contrail itself, made of ice crystals, was being used to create a singular sundog. Needless to say, many people posted on Facebook about he incident and video, and I would say that about half of them thought it was aliens. Many people wrote that they saw "the same thing" in their own towns, usually hundreds of kilometres away, and most often weeks earlier. What's more interesting is that several people felt comfortable enough to report their own UFO sightings, from 2019 but also many years in the past. Social media is ideal for finding additional witnesses to UFO sightings, but details and supporting evidence is greatly lacking in follow-up posts. In other news: the trailer has dropped for Spaceman, a documentary film about the disappearance of Granger Taylor, who was obsessed with aliens and UFOs. The film is due out on February 9, 2019. I was filmed for this on Vancouver Island last year, and I am hopeful it's going to be an interesting addition to the many sensational UFO movies that came out during 2018. And last but not least, our book When They Appeared, about the remarkable UFO encounter by Stefan Michalak in 1967, is now published by White Crow Books, and is available on Amazon in both paperback and ebook editions. Until now, it was very difficult for anyone not in Manitoba to get a copy as it was only available in small print run through a small publisher. Furthermore, for this new international edition, co-author Stan Michalak and I wrote additional material, so this is a somewhat revised and extended version as well. The Amazon listing is here. There's more news, but it will have to wait for now. Stay tuned.